Selecting lines by distance in a layer from a polyline in another layer using QGIS? I have 2 layers containing polylines. I'd like to establish the closest distance at any point along the line of one layer to the the lines on a different layer. My assumption is that the Nearest Neighbour Analysis doesn't do this. 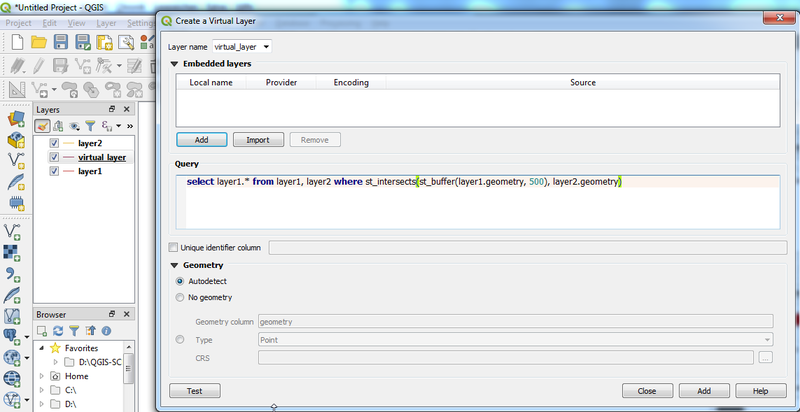 This will select all lines from layer1 which are in a distance from 500 (meters) to any geometry from layer2 and put the result into a new virtual layer. Not the answer you're looking for? Browse other questions tagged qgis distance or ask your own question. Calculating distance between point layer to n nearest polylines using QGIS? Find the point distance along a streams polyline? Calculating distance between points of same layer using QGIS?